IDICBeer 40k: Too big or not too big? Necrons were my first 40k army, and back then I was young, naive and wide eyed to the 40k universe. Like most people who choose their first army, I went for the army I thought looked the coolest, and to me the picture on the front of the Necron codex was cool enough for me to be hooked. I remember my friends who introduced me to 40k, groaning when I chose Necrons, but I had no idea how fantastic they were on the table at that stage. Of course that was way back when we were on third edition, and Necrons were the 'over powered' army. 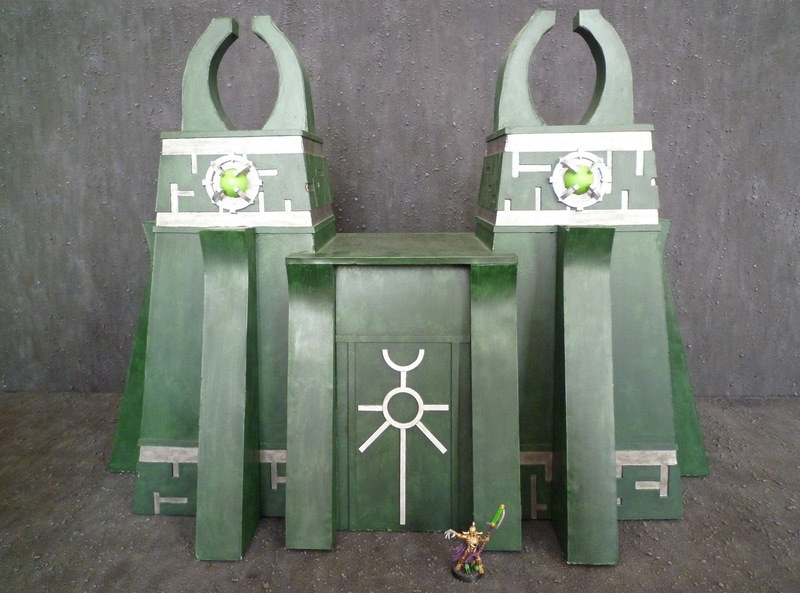 I was so hooked and so obsorbed with Necrons, that I decided to make my own Necron themed terrain gaming board, and in a time where I had no Internet inspiration, I had to rely on the Codex that I loved so dearly. So based on the look of the Codex terrain, and the terrain generator in the back of the Codex, I ploughed ahead and made my own board. Of course, having spent money and time making it, I wanted to use it, and my buddies and I did. Occasionally, it went down in the centre of the table, making way for some very interesting games. Mostly though, it was placed to one side of the board, looking pretty, but not being used, and cutting down the playing area a fair bit. Nowadays, especially with fifth edition 'tounament styled' missions, my Tomb mainly gets left in the cupboard. If you were playing on my board, would you want it on the table? Although I love this piece of terrain, it just seems too big? Maybe I should consider changing it? I could break it down into three sections or something? IT's too cool to cut up and change! "Like most people who choose their first army, I went for the army I thought looked the coolest," - heck, I do that with every new army! I like the tomb; would have no problem with it on a table. You've answered your own question in the article... "Occasionally, it went down in the centre of the table, making way for some very interesting games". To often I think we get pulled into the trap of setting up terrain as symetrically and inoffensively as possible - but the truly great games often are made so by a significant piece of terrain changing the way everyone plays. Slap it in the middle and assault armies have a haven to get close, shooty armies will need to manouevre to keep fire lanes - stick it on the side and you've got a scope for sneaky outflanking . either way - don't break it up! Don't change it, big terrain is awesome. especially if you throw it in the middle of the table and it creates a huge obstacle. the only addition maybe would be to add a set of steps or something so people could get to the top center and use that as a vantage point.